On the 12th day of Oscar Pistorius trial in Pretoria, police photographer showed the images of the bloody scene at the athlete’s house. Oscar Pistorius’ defense team says the police crime scene photographer failed to label his pictures correctly. Photographer Bennie Van Staden was being cross-examined for the second day by defense lawyer Barry Roux on details of when and where he took some photos and what he moved at the home of Oscar Pistorius. Bennie Van Staden’s testimony continued after the start of Tuesday’s proceedings was delayed by more than an hour after the defense team asked him to produce discs containing master copies of photographs. 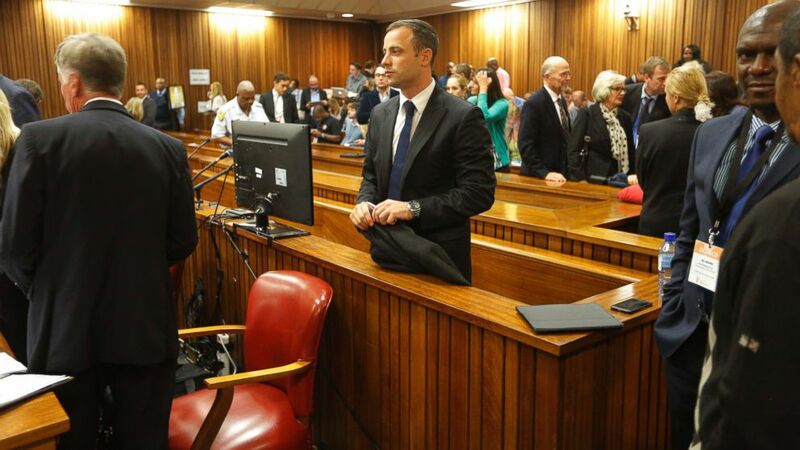 His images included the bloodied cricket bat Oscar Pistorius used to smash open the bathroom door as well as blood-soaked towels and two mobile phones. Bennie Van Staden was called to the scene at around 04:50 local time and took pictures of the accused and the deceased, as well as pictures of the rooms of the house. The police photographer rejected claims that his picture timeline was jumbled or unclear, saying that each of the photographs had the date and time it was taken on the picture. Bennie Van Staden also described nine photographs that he took of Oscar Pistorius soon after the shooting, with the athlete wearing blood-soaked shorts in the garage of his home. On Monday, the trial heard from a firearm specialist who said Oscar Pistorius had good knowledge of the rules on gun use and dealing with intruders. Oscar Pistorius had bought a gun from Sean Patrick Rens, a firearms assessor, in 2012 and ordered six more guns from him – but the order was cancelled a month after Reeva Steenkamp was killed. Sean Patrick Rens read out a competency questionnaire that Oscar Pistorius had completed before he could be issued with a firearm. Oscar Pistorius scored top marks in these tests, which included questions on the legal issues around shooting intruders.